Extension is helping families in need! 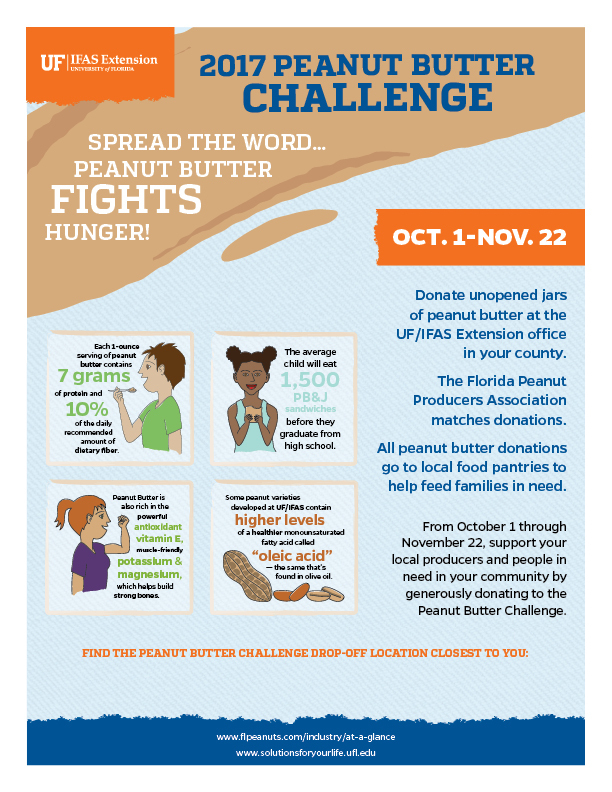 The Peanut Butter Challenge flyer was part of a larger strategic communications effort created to spread the word about the 2017 Peanut Butter Challenge. Donors were encouraged to provide jars of peanut butter and drop them off at various locations in Florida’s panhandle between October 1, 2017 and November 22, 2017. The Florida Peanut Producers Association then matched these donations to double the effort. The flyer includes fun facts and graphics with information about peanut butter’s benefits as well as information on how to donate. We repurposed the illustrated tiles on the flyer to promote the effort on digital platforms.